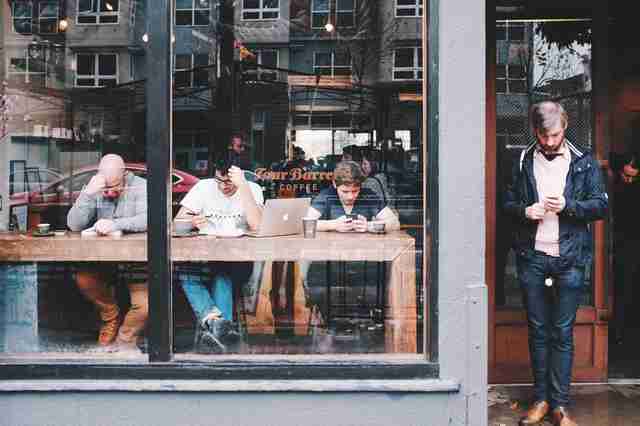 Being a great coffee shop isn't just about the quality of your espresso or the ratio of baristas generally interested in your day compared to condescending coffee snobs. It's about those special touches that weave a humble purveyor of warm beverages into the fabric of a community's everyday life. Like free Wi-Fi. 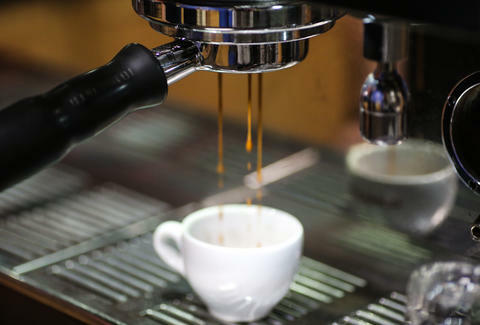 Since nearly every community has at least one caffeine hotspot that serves as a "third place" for people who "can't get work done at home," compiling a list of the 21 best was not an easy task. So to separate the gold from grounds we polled our nationwide staff of city editors as well as some of the biggest names in the coffee world. In the process we had to cut some iconic local haunts, new-school barista breeding grounds, and roasting titans, so your favorite might not be on the list. If we missed your home away from home, let us know in the comments, and the most popular suggestion will be added to the list as the people's choice. But don't let your vote be swayed too much by a tip flirt. 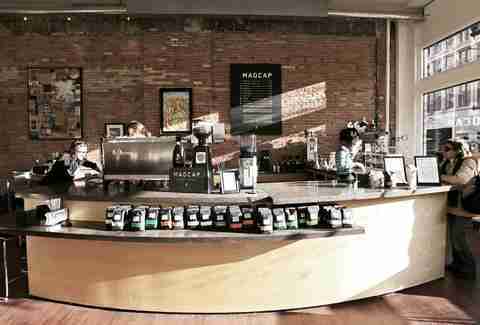 Clocking in at number three on our list of best roasters in the country, Madcap's put Grand Rapids on the coffee map and set themselves apart from other shops by offering tasting flights, serving espresso in snifters to emphasize the intense aromatics, and implementing a zero-waste policy by trading trash cans for bus bins and sorting all of their trash into compost and recyclables. Equal parts coffee roaster, bakery, and a community center, the French Press is such a large part of Santa Barbara that they actually hold a farmer's market in the parking lot. 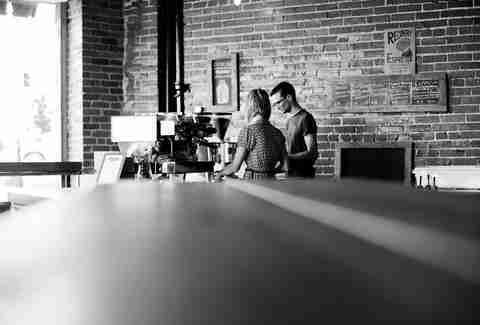 And even though they've got one of the top baristas in the world behind the bar, they still pride themselves on customer service over coffee knowledge. 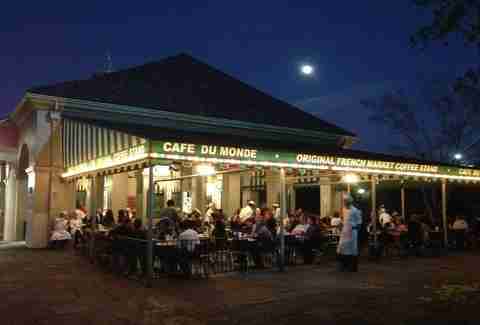 You won't find any bespectacled hipsters debating the virtues of the AeroPress at Cafe Du Monde. The New Orleans landmark is a snobbery-free zone, and earned a spot on our list thanks to their status as one of the oldest shops in America (est. 1862! ), a unique embrace of Chicory flavoring, and their legendary beignets. Pro-tip: Avoid the half-hour wait by heading to the take-out line. The slick, Scandanavian-influenced design of Heart comes courtesy of their Finnish owner, who used to be a pro snowboarder before going into the bean biz. Heart's serious enough about their coffee that they don't serve cold-brew because it doesn't meet their flavor standards, and they're so transparent with their roasting practices that their cafe is literally built around a black Probat roasting machine that allows customers to get a first-hand look at their craft. 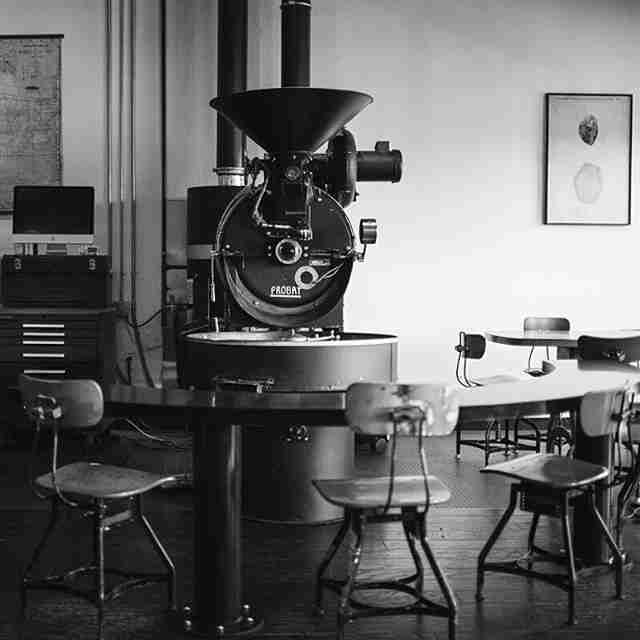 From the birthplace of second-wave coffee giants like Starbucks, Seattle Coffee Works claims to be the only active roastery in the Emerald City's downtown, and takes their service as seriously as their beans. For regular Joes, they offer an express side loaded with cafe pressing pots of international roasts. 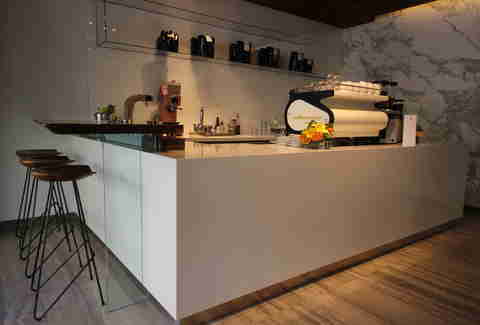 But the real magic happens in the Slow Bar, where patrons can pick from a variety of beans and brewing methods to compare the tastes of single-origin brews and test the cutting edge of coffee technology. 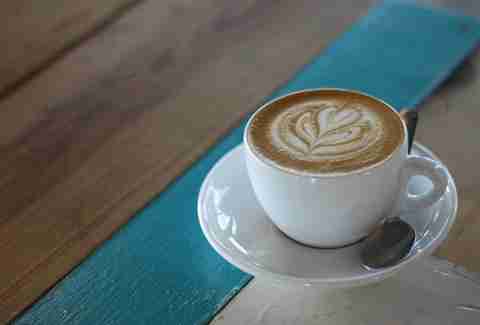 As close as you're going to get to an authentic Italian coffee bar in the Mile High City, Little Owl serves locally roasted, small-batch beans from Sweet Bloom and Commonwealth. The espresso drips from a serious La Marzocco Strada MP machine. The pastry selection is also top notch, with offerings like ham and cheese quiche. 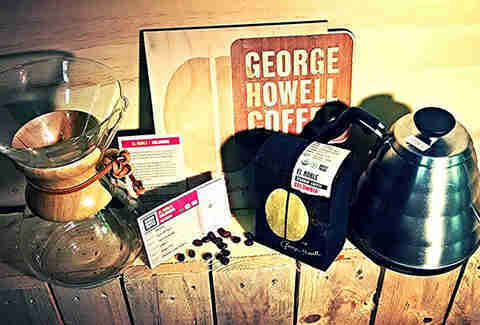 Although many shops on our list roast their own beans, no other can claim to have farmed them. Eternity Roasters in the heart of downtown Miami is the last stop in the founder's family's "seed-to-cup" vision that started on their Colombian coffee farm 60 years ago. When they're not brewing their own Colombian fare single-cup pour-over style, it's single-lot harvests from around the world that have gone through a rigorous blind taste-testing process to ensure beans never waver from the farmer's standard. The guy from Ristretto literally wrote the book on home brewing (How to Make Coffee Before You've Had Coffee: Ristretto Roasters' Spectacularly Simple Guide to Brewing at Home), but while he prescribes a wide range of at-home options, the star of his three shops are their Steampunk brewing systems. The most Portland-sounding machine ever, the Steampunk is a variation of syphon brewing that results in a faster and more consistent product than most any other single-cup system. 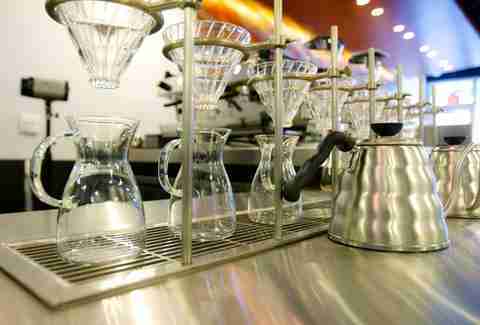 Ristretto also roasts in-house, allowing them to tune-in their flavors to specifically complement the experimental brewing method. 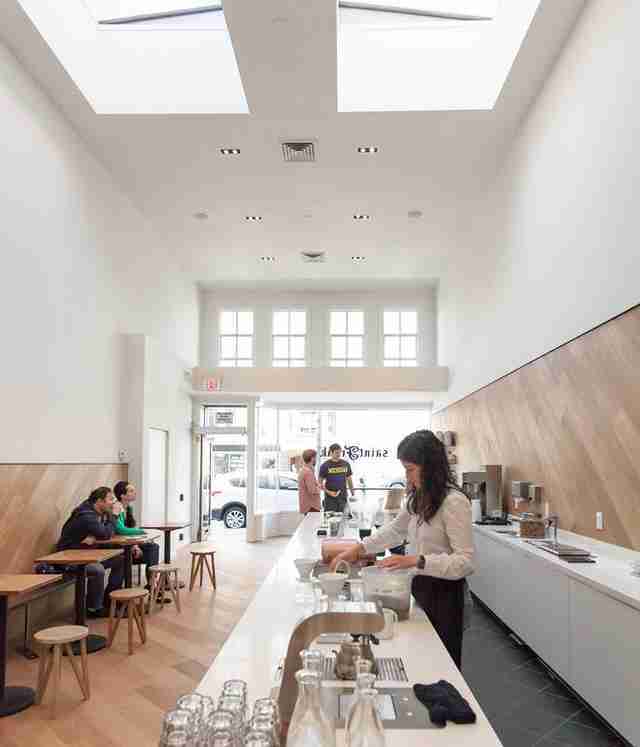 While many big-city coffee shops double as people-watching sites, Saint Frank is all about a serene coffee experience enhanced by blonde oak walls, skylights, and the fourth wall between barista and patron broken down by sinking the stylish Mod Bar espresso machines into the countertop. The founder entered the coffee world through local roasters Ritual, and he's still sticking with them, using the espresso in everything from lattes with housemade almond milk to a rarely seen espresso and tonic. 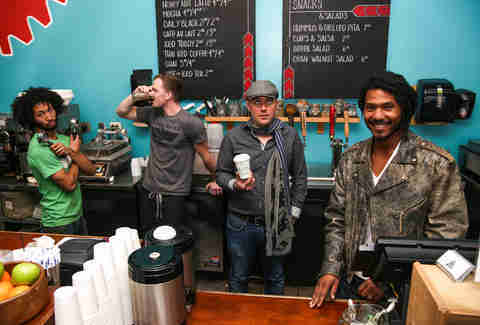 The champion baristas and overall coffee gurus behind G&B (Kyle G. and Charles B.) 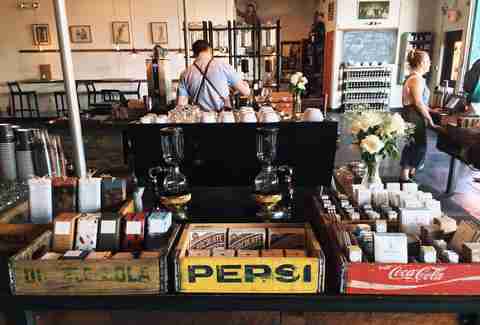 take the term "coffee bar" literally. Tucked into LA's Grand Central Market, G&B is just one long bar at which they encourage patrons to mingle while enjoying espresso drinks served in reusable glass jars. Their second shop, Go Get Em Tiger, flips this standing-bar idea for more diner-style bar service in which patrons are circled around the barista area in order to encourage a more friendly environment. 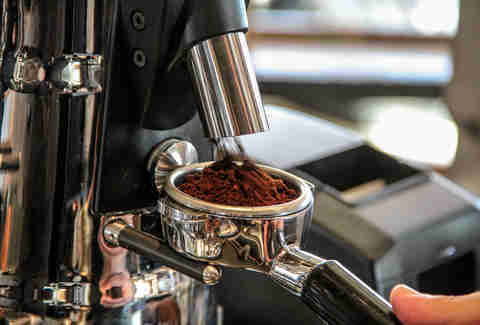 Rocking a wood-handled Slayer espresso machine, Barista Parlor's always serving beans from at least three different roasters, from up-and-comers like Minneapolis's Dogwood to nationally renowned caffeinators like Intelligentsia and Stumptown. The vibe is all-artisan-everything -- from the uniforms to the furniture -- and they've just entered a partnership with one of the guys from the Black Keys to open a second location, which will feature a roastery enclosed in glass and framed with wooden beams reclaimed from the original George Dickel Distillery. The only spot on the list where you can both get your bike fixed and score a caffeine fix, Heritage is run by a fifth-generation Chicagoan who cut his teeth building vintage-inspired bikes in the East Village before moving back to the Chi to dedicate himself to custom-crafted bikes and serious coffee, including a pour-over station and cold-brewed Stumptown Hair Bender. 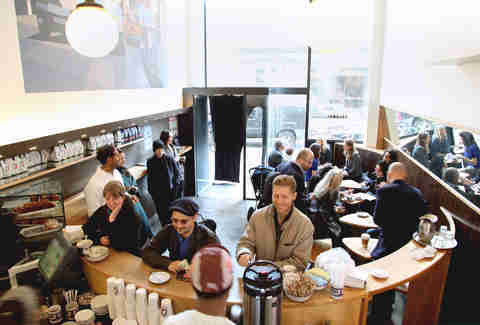 Pretentious-quality coffee without the pretentiousness, Everyman opened in 2007 in the cramped corner of the lobby of a theater near Union Square and expanded in 2012 to an equally-cramped storefront of their own. 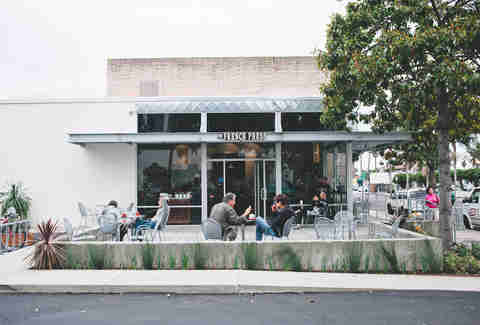 The owner has coffee tattoos on his knuckles, single-origin roasts on the brain, and no menu on the wall: instead of awkwardly gazing at a chalkboard, customers are encouraged to awkwardly converse with the baristas to settle on their order, forcing a bit more humanity into the transaction and encouraging experimentation with AeroPress and Chemex. 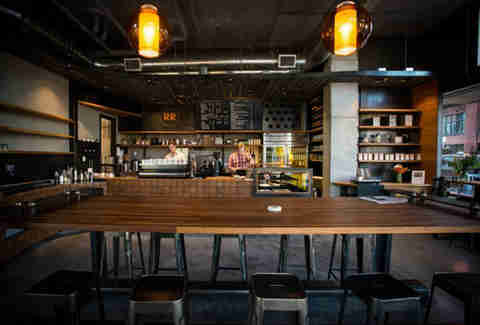 Part-coffee shop, part-fixie parking lot, Four Barrel is housed in a former industrial warehouse in San Francisco's Mission neighborhood, where your coffee is literally made bean-to-cup in the coffee version of an open kitchen, right smack dab behind the register. Not only is the coffee some of the best in the caffeine-rich 7x7 (credit partners that include Stumptown and Ritual vets), but it's also just generally an awesome spot to enjoy an affogato; large bay windows face people-watching-rich Valencia Street, they only play vinyl, and they're the home of the infamous Great Four Barrel Boar Burglary, which was about as awesome as it sounds. By day, Ascension’s using a $20k espresso machine to brew beans from the largest privately owned plantation in Rwanda, because the owner just happens to sit on the board. At night, they move all the tables -- which are made from former bowling alley lanes -- to form an intimate wine bar with a killer menu. Pro tip: Go for the Kyoto drip. 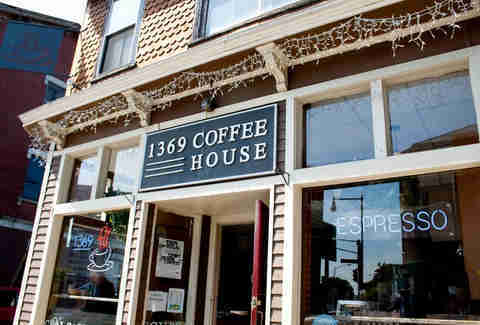 If ever an indie coffee house captured the eclectic character of its 'hood -- from Harvard grad students and journaling hipsters, to Spanish tourists and aging hippies who ask you to use your laptop in the back of the cafe because they need some "technology free" time (not even kidding) -- 1369 is that place. With two locations a stone's throw away from one another (one Inman, one Central), this bustling, always-hard-to-find-a-table-at Cambridge icon's been pouring high-grade java for over 20 years, serving it alongside tasty scones, tons of teas, and occasional live tunes. And that's to say nothing of the chipotle-spiced Mexican hot cocoa. 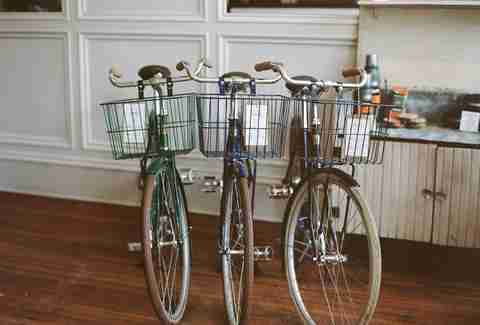 They even deliver growlers of their popular cold-brewed iced coffee… by bike, of course. Neither snow, nor rain, nor sleet, nor massive lines at the Supreme store next door can keep SoHo loyalists from this sleek, high-ceilinged caffeine Mecca. One of four NYC outposts of the premium roasters (who got their start in Philly 20 years back), this one has a special place in our hearts... because it’s right around the corner from Thrillist’s headquarters. Well, that and the rich house blends. And the almond croissants. Alright, so there’re a few things. 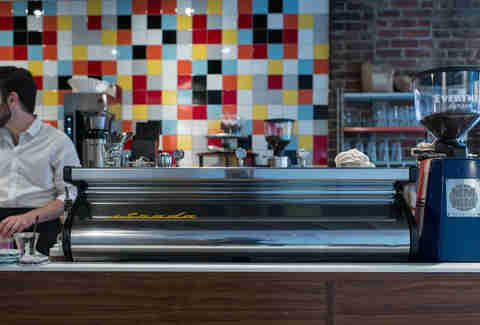 Don’t be daunted by the line, either: it moves quickly thanks to the professional-as-hell barista corps. George spent 20 years building his brand of Coffee Connection shops to 24 locations, then sold out to Starbucks to focus on traveling the world to help strengthen the international coffee-sustainability infrastructure. 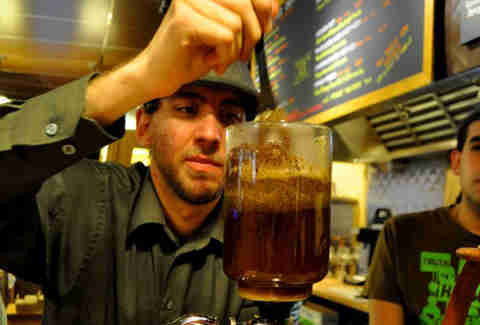 After earning every coffee award ever, he threw his hat back into the coffee shop ring in 2012 to reopen a cafe outside of Boston serving his own roasts to dedicated coffee pilgrims. 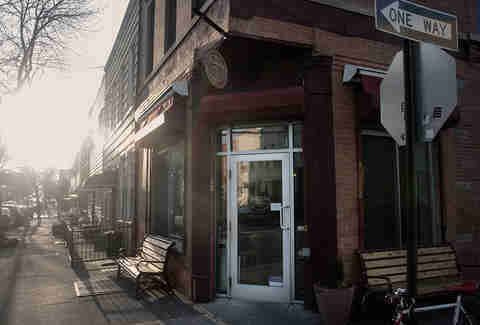 Making Greenpoint cool before it was New Williamsburg, Cafe Grumpy opened their first shop on Meserole in 2005, back when the neighborhood was mostly Polish immigrants with just a salt and peppering of hipsters. The success of the shop has grown it from a quiet study spot with an adorable book exchange to a six-location giant with its own roastery and cameos as Lena Dunham's place of employment in the HBO show Girls. In a space that formerly housed Houston's most iconic gay bar, Blacksmith sets itself apart from the rest of the Houston coffee scene thanks to its all-star cast of city veterans, including the roaster of Greenway Coffee and the guys behind Beard-lauded establishments Anvil and Underbelly. Expect meticulously sourced beans from African farmers' collectives paired with special pop-up food offerings like smoked bologna tacos. Having lived in Austin for 15 years, and spent countless hours coffee-shop camping, it's impossible to choose a singular best in the city without losing my Wi-Fi privileges everywhere else. But the city is also loaded with so many great shops! Despite the proliferation of places pulling single-origin cups, it can still be nearly impossible to find a seat, let alone a power outlet. My favorite changes like the weather. For pure espresso excellence, I've gotta tip my hat to Caffe Medici and Houndstooth for their ability to give you 10 adjectives for every one of their beans; Thunderbird for being a perfect neighborhood meeting ground; Once Over for their lower-key, oasis-like vibe; Brew & Brew for their love of the AeroPress and emphasis on craft brews; and Cenote for attaining a well-tuned balance of all the above qualities. Dan Gentile is a staff writer on Thrillist's national food and drink team. In the course of compiling this list, he drank at least 21 cups of coffee. Pray for his sleep cycle and follow late-night tweets at @Dannosphere.